Skin. It seems such a trivial subject. If you are one of the “lucky” ones, you have a clear complexion and rarely think of it. But if your skin has any amount of issues: acne, uneven tone or texture, dryness, oiliness, and the list goes on, you probably think about it a lot! In the morning when you first get ready, each time you are in front of a mirror throughout the day, washing up at the end of the day. If you have major skin problems, it has likely led to self-consciousness, embarrassment, and in some cases even depression. I wish I could tell you I have the miracle 5 second cure. I don’t. Skin is complicated and everyone’s is different. What I do have is an arsenal of natural options and tips to help you clear up most issues. It may take some playing around and testing what makes your skin happy. In the long run, it is so worth it, I promise! At the top of this post are 2 photos of me “before.” This was a little ways into my natural skin routines, and let me tell you, it has been much worse in the past. I only show you my photos “au naturel” because I love you. 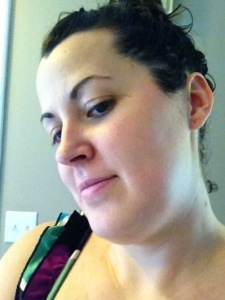 This is filter and edit free (so are my “after” shots)! I had never had bad acne, just the odd breakout, and small whiteheads along my forehead. I have always followed the more is more approach to skin care. Scrub twice a day, use toner, exfoliate a couple times a week. Now, this in and of itself is not the issue, per se, but rather the products used to achieve it. A few years later, and I was in full Eco Housewife mode. 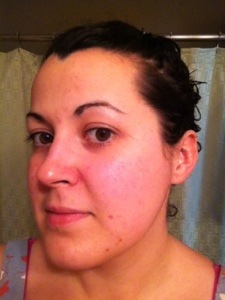 So wouldn’t it make sense to find out the natural options for my skin? I tried the trusty health food store, but wasn’t 100% satisfied. I was sure there was an easier option. Enter the Internet. Apparently there is thing thing called the “OCM” or “Oil Cleansing Method.” Here is the general idea: facial soaps over-dry the skin, irritating it and leaving it susceptible to contamination and causing it to over-produce sebum, therefore breaking you out. Similar to the scalp in Nicole post here, all I needed to do was help restore my skin’s natural moisture balance and it would look after itself! The other tenant of OCM is that like dissolved like. What this means is that oil dissolves oil. So using oil to “wash” your face actually helps to break down the clogged and hardened oil breaking out your skin. I think of it like paint – if you have ever used oil-based paint, there are two ways to clean your brushes – stripper or oil – which one damages your brush more? The chemical stripper! The oil will not only clean your brush, but soften and condition it! Now, since this post gets into more than just OCM, I will direct you to two websites that lay out the “how-to” beautifully: Crunchy Betty and This Page. But here is the clincher – I am eating healthy! The husband and I are majorly cutting back on grains and white carbs, we have all but eliminated processed food, and also stopped eating dairy. WHAT? NO DAIRY? I know, I know. But here’s the thing – my naturopath long ago discovered that I am allergic to dairy (casein, specifically) and it was causing my runny nose, earaches, digestive upset, and quite possible BREAKOUTS. So if you have chronic acne, I highly suggest a visit to your local naturopath, as you may have an allergy that is the underlying issue. Ok-back to diet. Since we cleaned up our act, I break out less, and I notice that I am more prone to breaking out on our “cheat” days. 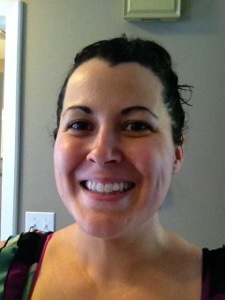 So as much as I miss ice cream, I love being able to put on less makeup before heading out in the morning. And I love that my skin care routine is really so simple! *all oils are organic and high quality – this is going on your face, right?! Soak the thyme in the witch hazel for 2-4 days. Strain out thyme. Place witch hazel in a bottle and add desired essential oil. Lemon oil brightens, but can make skin more sensitive to sunlight in summer. Good ol’ tea tree for acne ka-pow! Another great toner is a simple mixture of 1/3 apple cider vinegar and 2/3 water. It works wonderfully on breakouts. Stir it all up to avoid clumps. Scrub before getting into the shower. Shower off, or wipe off with a warm washcloth. I make this one in small batches because the baking soda fizzes up a bit and doesn’t feel as nice a few days later. Juice Monkeys – the fruit and veggie kind! I know, I know, it seems like we make a lot food decisions based on documentaries. But look at it as an hour or two contains A LOT of information, and it is up to you what you do with that. We decided to make some changes with our eating. 1. Freshly pressed juice contains a lot of macronutrients. These nutrients include vitamins, minerals and other health and immune boosting components. 2. You get the health benefits of so many more vegetables and fruit than you would EVER be able to consume in one day. Just think, for breakfast, would you be able to eat an apple, half a grapefruit, half a cucumber, 4-5 leaves of kale, a handful each of parsley and spinach? I highly doubt it! By juicing, we remove the insoluble fibre, but keep the soluble fibre and all of the nutrients intact, and you can consume all of that in your juice! So with all of this lovely knowledge, we had to decide how we were going to bring it into our diet. Although in “Fat, Sick and Nearly Dead,” Joe goes on a 60 day juicing fast, we knew that wasn’t for us. So we started slowly. We made juice the night before and had it ready and on-hand to replace our breakfast. 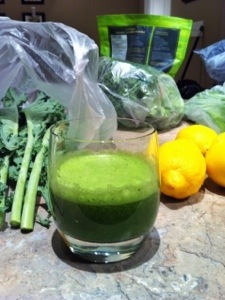 This is a great way to introduce fresh juice. It replaces a meal many of us are likely to skip anyhow, and it is a great grab-and-go option. Another choice is simply to include a nice tall glass of freshly pressed juice as a snack, or along with your lunch. It is better than not at all, and will kick start you getting all of those amazing nutrients! After a few days of juice as breakfast, we decide to take the plunge…in the shallow end…and we are currently on a 5 day juice fast/cleanse. A big part of why we are doing this is to detoxify and clean out our bodies. Rather than get into detail here on this 5 day program, check out the Reboot website! I would rather leave it to the experts to explain all of the dirty details, instead of missing something vital here! Once we have finished this 5 day plan, I will let you know how it went, and how we feel. 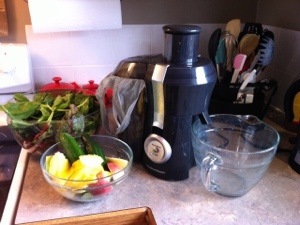 So, onto the fun part, juicing! Here is my advice. I hope it helps! 1. The first thing you will need is a good quality juicer. Don’t feel like you have to break the bank, but do some research and make sure it can handle leafy greens and firmer fruit, like apples. You don’t want to try and start juicing and all you bought was a citrus juicer! 2. Try to juice organic produce when you can find it and if you can afford it. It means that no pesticides etc will be in your detox juice, when that is the garbage you are trying to get out of your body anyways! If you can’t go organic, be sure to wash all produce very well before juicing. It is best to leave the peel intact on apples, pears and carrots if you can, so scrub away! 3. Beets hold a lot of dirt, so either peel them or scrub them well, organic or not. Muddy tasting juice isn’t enjoyable for anyone! 4. Citrus fruit – to peel or not to peel? Again, if it is non-organic, scrub well. Some citrus fruit may even be waxed, so check for that before juicing. Otherwise, it is a personal flavour decision. I enjoy the fresh, bright flavour of lemon rind, but my husband finds it too sour and prefers to peel lemons. As far as oranges and grapefruit go, we have peeled them every time. 5. Follow the manufacturer’s instructions for your juicer. Know what it can handle, how you are supposed to juice certain items. I got out juicer for free on Freecycle, so I had no instructions. If you happen to be sans instructions as well, it is usually a good idea to start with an easy to juice item, like a cucumber, follow with all the leafy greens, then apples, and end with easy juicers with a lot of liquid, like cucumber, pineapple or citrus fruits. This makes sure that cleaning your juicer goes much easier and nothing gets clogged up. 6. Experiment! It is just juice! Try a little ginger, it is full of healthy benefits. Be brave and juice some garlic! Whaaaaaaat???!!! I know…people do it. I have not yet been that brave! 7. Don’t try to juice avocado or bananas!!! If you want these in your juice, you will have to blend them with your juice in your blender. This isn’t a bad thing, and it creates a thicker, more smoothie-like texture. 8. Put a bag in the part of your juice to catch all of the non juicy waste. Even better if the bag is compostable and you compost everything instead of throwing it away. Juice it all up! Much better cold (refrigerated or poured over ice). So good poured over ice, still frothy from the juicer! First off I want to thank the ladies at The Eco-housewives for asking me to write a guest post! We went to high school together but lost touch over the years and it is nice to watch their families grow and get to know each other again! I am married to a very hard working man who is father to my three children aged 1-4 years old. We currently live on the East side of Canada and I am loving the early(ish) spring that they have here! I am a stay-at-home mom and I’m looking into homeschool for my oldest this fall. I am also an active member of the Weston A Price Foundation and a doTerra independent consultant. I was reading about how Wellness Mama makes vitamin gummies for her kids and thought that would be a great way to get my kids to take their fermented cod liver oil (FCLO). Why don’t you just give your kids the yummy tasting regular cod liver oil you ask? Because the regular stuff is heat processed, bleached, and deodorized to remove that fishy taste and the vitamins (usually synthetic) are then added back in. FCLO is the old fashion processing techniques, which involves fermenting and a proprietary filtering method, all at low temperatures to preserve the fragile unsaturated fatty acids and vitamins. FCLO is also higher in the wonderful vitamins D, A, and K2 and therefore you can take a smaller does. If you are interested in more information about FCLO you can visit HERE. 1/2 cup of liquid. You could use fruit juice, water Kefir or even Kombucha! If you are lucky to have the awesome gelatin that dissolves easily in cold water then mix everything together really well (maybe in a Magic bullet?) and pour into your greased ice cube trays to set. 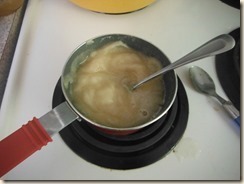 Warm your juice and dissolve your gelatin. 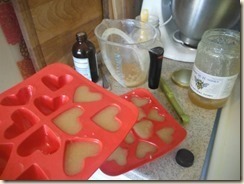 Remove from heat and let cool slightly before adding your honey and vitamins and flavouring. If your mixture is too hot your essential oil will evaporate, your honey will no longer be raw and your vitamins may be compromised….so let it cool a little! One child serving of FCLO is 1/4 tsp. 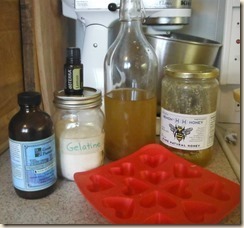 I put 3 tsp into this recipe to get 12 large gummies…which last me 4 days. Pop them in the fridge to keep them fresh. The beauty about switching to a more natural choice for health and body care is that you open yourself to the option, in many cases, to be able to make it or buy it. Some of us are extremely busy and prefer to head to the local health store and pick something up. 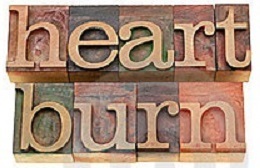 I am often that way myself, especially until I have done the research to find the best way to make it. Enter natural toothpaste. I have to admit, I didn’t decide to switch because of the “great fluoride debate.” Instead, I wanted to access all of the amazing natural solutions there are for healthy, clean teeth without the processed items in commercial toothpaste. My first try was pretty nasty-a blob of coconut oil mashed up with baking soda and a bit of stevia to sweeten it. My teeth felt clean but it tasted awful. Not to mention the fact that there weren’t many dental benefits to the mixture. So I started to look into it and found that there were so many options to make the switch from toothpaste. 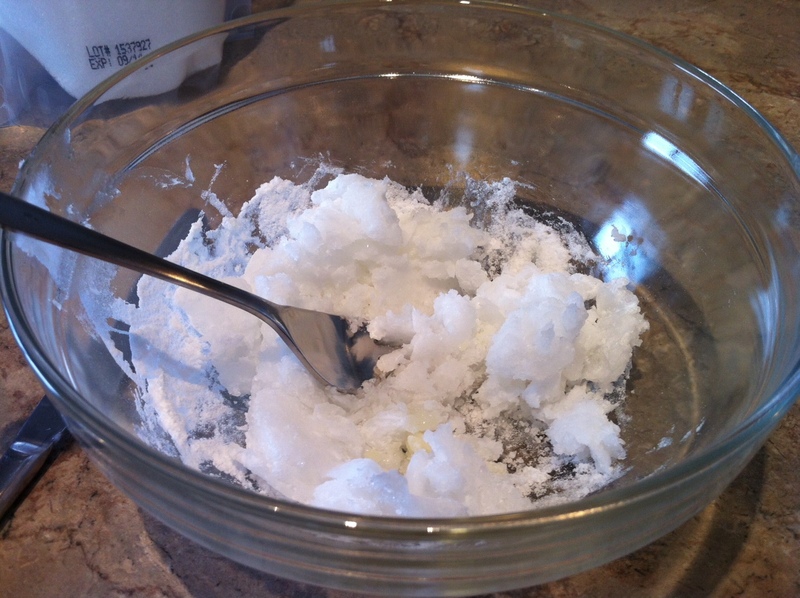 Some use the simple coconut oil/baking soda mix, some use a bar of soap (imagine the taste! ), and others got really complicated! I like to think that my recipe is the middle of the line. I was going to include calcium carbonate, and even found a recipe to make my own powder using egg shells…and then the egg shells broke my coffee grinder…so that was out. This recipe doesn’t make you ruin your only ticket to daily caffeine! If you can find calcium carbonate already powdered, feel free to use it in place of some of the baking soda. Coconut oil: This is key for developing the toothpaste texture. I also like to think when I brush with coconut oil I am getting some similar benefits to oil pulling. Baking soda: Used to help scrub the teeth clean. Some people believe it is too abrasive, but overall it isn’t any more abrasive than other toothpaste ingredients. If you want to, feel free to use half baking soda and half calcium carbonate powder for a less abrasive paste. 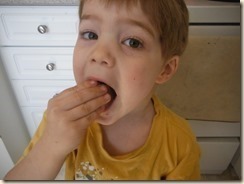 Xylitol: Here it is – the wonder-paste ingredient! Xylitol helps to “remineralize” teeth. It also helps to prevent cavities and achieves this by slowing bacteria growth in the mouth, which decreases plaque and cavities! As a wonderful bonus, Xylitol sweetens the toothpaste without adding sugar! Dr. Bronner’s Peppermint Castile Soap: Don’t judge. 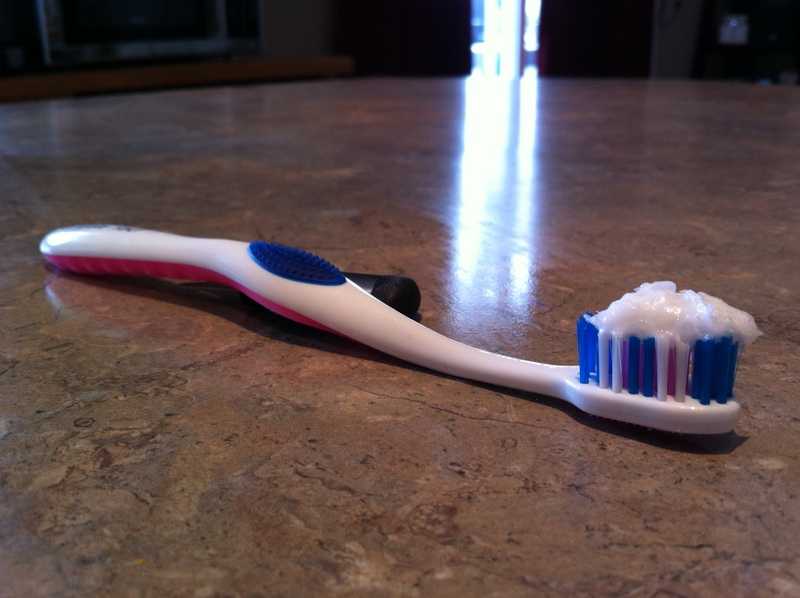 Remember, there are people scraping a toothbrush across a bar of soap and brushing with it. I used it in my recipe because it helps to scrub things clean, it adds that “foaming effect” we all love our toothpaste to have, and the peppermint kind doesn’t taste very soapy. Yes I put some on my finger and licked it. It was minty. And the bottle says you can – so there. Essential Oils: Of course these are in here! This is where you get to customize your toothpaste! Peppermint: Prevents bad breath, antiseptic. Cinnamon: Prevents bad breath, helps with mild sensitivity, fights bacteria. Clove: Excellent for teeth with greater sensitivity. Dentists actually use clove oil as a numbing agent! If you have a toothache you can apply clove oil directly to the affected area! Tea Tree: Prevents bad breath, helps with gum disease, gingivitis and inflammation, fights bacteria. If you can stand the taste! Pregnant or breast feeding women, and also children, should avoid tea tree oil. * Remember, use essential oils sparingly, excessive amounts may cause irritation. Some people are sensitive or allergic to certain essential oils. Always make sure you use essential oils that are safe to ingest – some are processed and marked as external use only. Your health food store should be able to help you find the right quality. 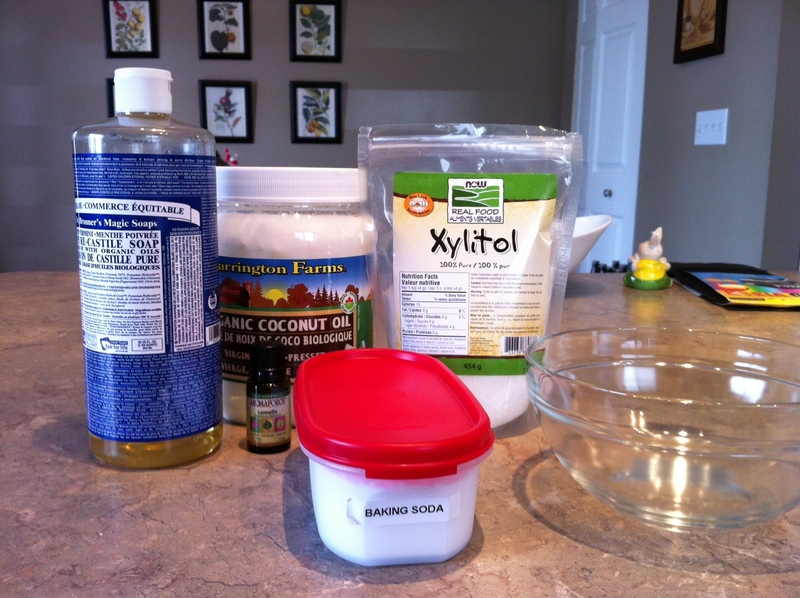 Mash the coconut oil, baking soda and xylitol together until blended. Add Castile soap and oils and mix until smooth. 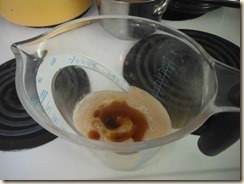 If required, add in a few drops of water until you reach the consistency you like. The toothpaste will have a slightly grittier texture from the xylitol. If you are like Picky Husband you can grind it in a spice grinder until it is finer. 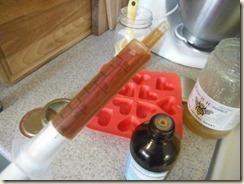 This recipe fits wonderfully into a clean soap dispenser or a squeeze tube. You will want something with a wider opening so it is easier to fill. You can put it in a jar and then stick your dirty toothbrush into your clean batch of toothpaste if you want…but isn’t the whole point here to reduce bacteria? Now go brush your teeth! And share – what was your essential oil blend? Have we won you to the green side? Colloidal Silver: This stuff is a powerful antibacterial and is great for ear infections, pink eye, styes and even sinus infections. Just spray it in your eye or ears–you can even put it in water to fight off colds or the flu. Oil of Oregano: My mother-in-law swears by this stuff. If I’m at her house with a cold, I do my best to hide it from her because without a doubt she tries to get me to drink some. It taste AWFUL, but I have to admit that this powerful antibacterial works! Use it if you feel a cold or flu coming on! My mother-in-law squirts a few drops on yogurt and ingests it that way. Oscillococcinum: This homeopathic remedy is great for the whole family-even babies! Take Oscillococcinum as soon as you start feeling run down or have other flu-like symptoms like the chills, or a headache! Arnica: I love this stuff! It was my best friend post-partum after Abigail was born. It is WONDERFUL for bruising and swelling, but it is also great for emotional or physical shock and can be taken internally. Olbas Oil: This essential oil blend is lovely for clearing sinuses and I’ve found it works so much better than over the counter nasal sprays! Lavender Oil: Another great essential oil to keep handy, especially with active toddlers! It is great for cuts and bruises and can be put directly on the affected area. Lavender oil is also good for acne. 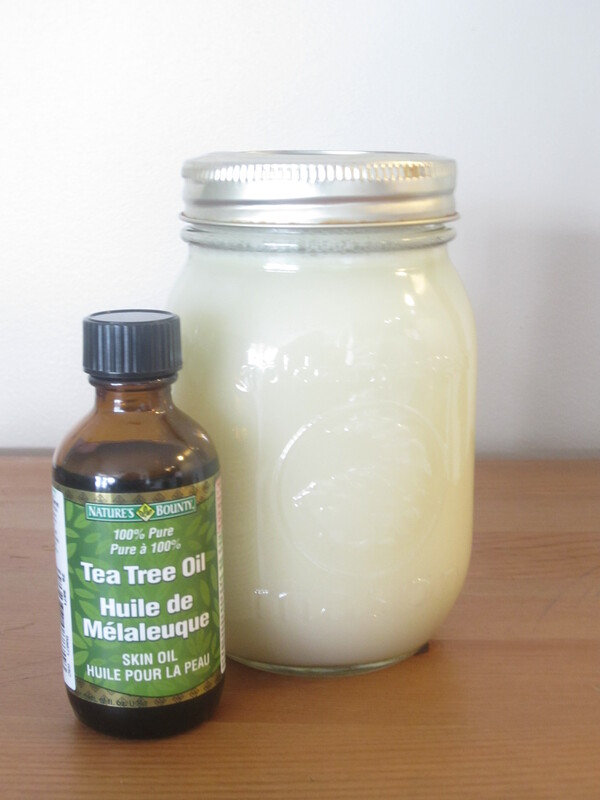 Tea tree oil: I LOVE the smell of tea tree oil (weird, I know, but I can’t help it). This is a potent antibacterial disinfectant and needs to be diluted. It can be used for acne treatment, a sore throat and congestion. It can even be used for dandruff and lice. The list of tea tree oil uses is extensive, but tea tree oil should be avoided if you are pregnant or breastfeeding. Probiotics: Probiotics are wonderful! I’ve been taking acidophilus for years! Probiotics are good bacteria that when eaten in the right amount have many health benefits. Once in the colon, the bacteria multiply and help to keep a balance between the good and bad bacteria that live there. Probiotics should be taken if you’re prescribed antibiotics or if you’re trying to treat diarrhoea. There are a lot more great natural remedies out there, but these are the ones that I am familiar with and work for our family. What about you? Have you tried any of these remedies, or do you have your own personal faves? *Before trying any of these remedies, it’s always a good idea to consult an ND, pharmacist or (if applicable) your obstetrician. Diaper rash. Something every little one is probably going to experience at least once in their diaper wearing lifetime. And, if you’re a mom I’m sure you know, it is no fun for anyone. Luckily for me, I didn’t have to deal with my first bout of rashiness until my son was almost 1! We had gone on a long roadtrip, and sure enough, before we made it back home it had begun to spread pretty bad. I did use Penaten in the beginning. My mom (and most moms from her generation I think) swear by it. But it didn’t work very well for me at all. The rash lingered. My son had his 1 year well baby visit soon after so I showed it to the doctor, and she said it looked like it could be a yeast rash and to try using the over the counter yeast infection cream I would use for myself. Well, I don’t use it and I wasn’t about to use it on my son if I could find a better alternative. So, I set off on a hunt for some natural alternatives for treating the yeast (and regular) diaper rash. I am happy to say that it was fairly easy and the options are pretty diverse. So, instead of detailing my journey, I’m just going share with you what I found has worked out best for my son and I! 1. 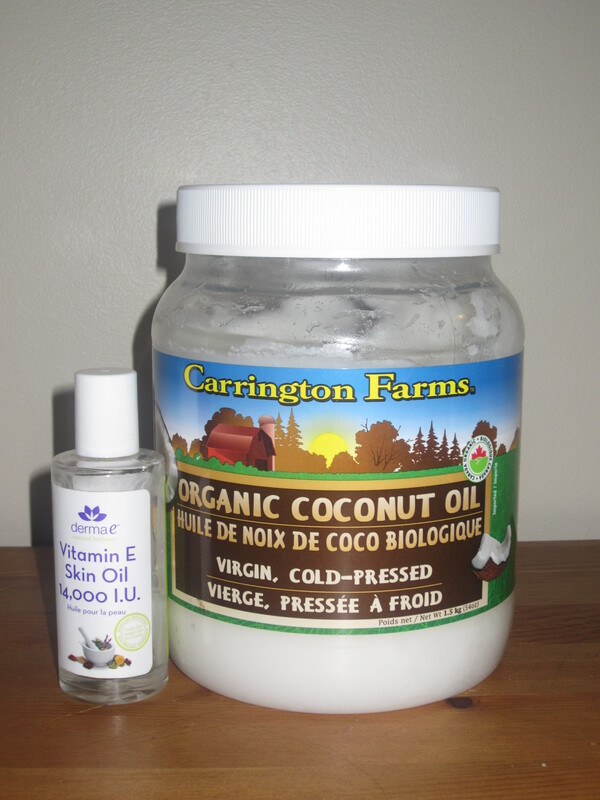 Coconut oil – virgin, unrefined is best. This is a great alternative for Vaseline as a moisture barrier and awesome for minor rashes. 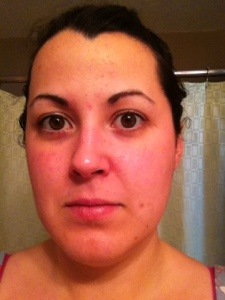 Mix a bit of topical grade vitamin E in with it and it works even better! And, it’s cloth diaper friendly. But, if you do mix in the vitamin E don’t let your little one get it in his mouth as that type of vitamin E is not meant to be ingested. If you have a pretty fantastic rash to deal with though, I find you’ll need to use some other tactics as well. 2. I’m sure you’ve heard it before but I’m going to say it again – let them have lots of, what we call in our house, naked bum time! Let them have at least 15 minutes a day, and let their bums dry after being wiped before putting that clean diaper on. 3. Natural fibres (my favourite is hemp)!! If you cloth diaper, and this is an option for you (I’m in no way saying run out and buy more diapers!) use natural fibres. I have a lot of info and opinions about natural vs synthetic (I sewed all my own diapers and used both!) and if you ever wanted to have a discussion or ask questions I’d love to chat with you! But, for today, I will make just one point. Polyester is a petroleum product – not eco-friendly at all. 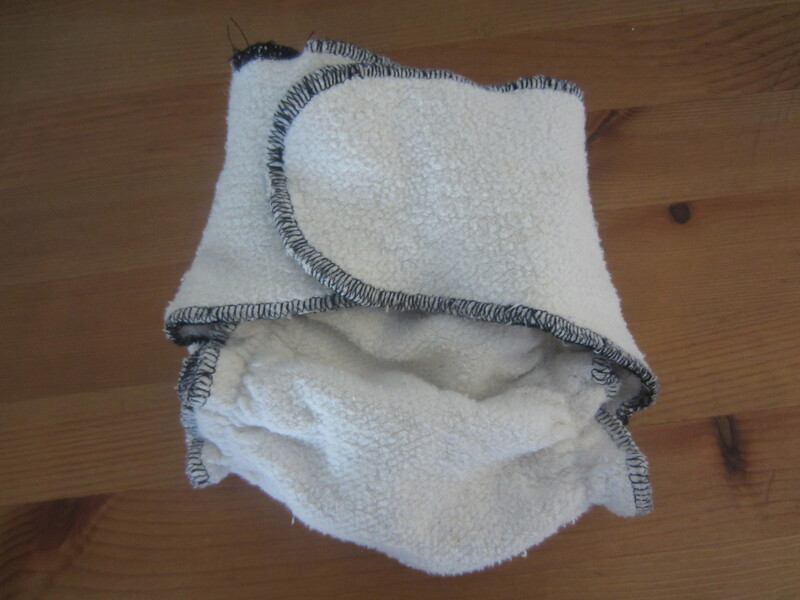 I know it’s hard to get away from it when cloth diapering, and obviously cloth diapering is much better for the environment (and baby’s bottom) either way, but I like to keep my use of synthetics to a minimum i.e. only in the covers. Natural fibres breathe and this is oh so important when it comes to treating and keeping that nasty rash away. If you have wool covers use them as much as you can while the rash is around! 4. Don’t use throw away wipes – at all if you can. If you do use them, try to get ones without alcohol as it can not only be painful on baby’s bum, but it also dries out the skin and aggravates rashes. 5. Use a cloth wipe solution that contains antibacterial and/or anti-fungal essential oils with your wipes. Zany Zebra has several nice ones to try here. I make the Olive n’ Tea Tree Oil solution. Once I’ve mixed it up I store it in glass jars. I dilute it down to 3:1 water to solution and it still works great. I use it periodically rash or not (I basically alternate with pure water back and forth) and to be honest, since I started using it my son hasn’t had a single diaper rash so it must work pretty well! 6. 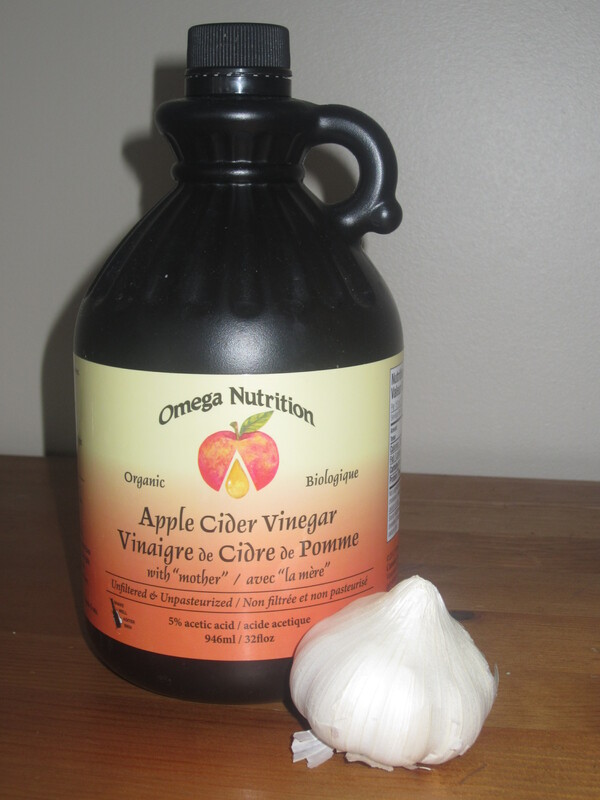 Finally, Apple Cider Vinegar (organic with the ‘mother’) and raw garlic are an amazing defense for yeast rashes. Crush one raw clove of garlic with 2 tbsp of ACV into 1 cup of hot (not boiling) water. Let it sit for at least half an hour before using. You’ll want to store it in something with a wide mouth. After you’ve cleaned your little one’s bum you pat the solution on to the rash with a cloth. Let it dry a bit before putting on the diaper. The garlic and ACV help kill the yeast. It will eventually start to dry out baby’s bum though, so I like to alternate each diaper change with coconut oil. There are so many more safe and effective alternatives (sometimes more so than the ‘traditional’ routes) than the ones I’ve listed here. What are some of your go to treatments for diaper rash?